According to a number of Christian writers and teachers on Bible prophecy, Jesus predicted in the Olivet Discourse that a pronounced increase in the frequency and intensity of earthquakes would occur just prior to His return to the earth. Many of the same writers and teachers claim that the decade of the 1990s has experienced a pronounced increase in both the frequency and intensity of earthquakes as compared to the earlier decades of the twentieth century. This coincidence of Jesus' prophetic statement and recent seismic events is viewed by these writers and teachers as clear demonstration of the nearness of the return of Christ. What is the source of Lindsey's statistics? In his book Planet Earth 2000 A.D. Lindsey cites the United States Geological Survey (USGS) in Boulder, Colorado.2 Yet he does not give details of the report (author, date, report name, location, etc. ).3 Lindsey's earthquake frequency numbers have been widely circulated by popular prophecy speakers such as Chuck Missler and Jack Van Impe.4 However, Missler and Van Impe do not give any further information on the source of Lindsey's statistics. What is the specific source within Energy, Mines and Resources Canada that supplied these statistics? Again, details are lacking. In light of such slipshod documentation, we are concerned about the widespread claim within the Christian community that earthquakes are on the increase. Can these recent statements be supported by rigorous documentation? Or have the deployment of more seismographs during the last few decades made detection and cataloging of earthquakes more complete, thereby enhancing the perception of increase? Does the public have the perception that earthquakes are on the increase because earthquakes now afflict our larger urbanized populations, and, therefore, are more often reported by the media? We believe the public perception and media characterization promotes the self-sustaizing "urban legend" even among the Christian Church.14 This "legend" widespread in western culture regards earthquakes of the twentieth century to be on the increase. We will cite data that directly confront the urban legend. The year 1997 marked the one hundredth anniversary of the general deployment of standardized and calibrated seismographs. It started with nine seismograph stations in 1898 that were capable of detecting, locating and measuring earthquakes of magnitude 7.0 or larger (M ³7.0) anywhere in the globe. As a result, major earthquakes have been monitored globally and continuously for more than 100 years. By 1931 there were 350 stations operating worldwide that were locating and measuring M ³6.5 earthquakes globally. By the 1950s the system of seismographs could locate all M ³6.0 events occurring globally. Today a network of more than 4,000 seismograph stations is locating and measuring more than 10,000 events with magnitude less than 5.0 each year. Global earthquake data for the century have been synthesized and are available from several sources. These are usually extensive lists giving each earthquake as a time, location and magnitude. Before we look to the earthquake data of the twentieth century for possible increase in frequency and magnitude, we need to be able to evaluate the suitability of catalog data. Three important properties are required of data used for frequency analysis. Data must be (1) accurate, (2) complete and (3) uniform. Accuracy. Earthquake data need to satisfy several technical requirements; the most important of which is accuracy. The consortium of seismological institutions has set standards. Normally the seismogram from the region of the earthquake is used to estimate "authoritative" earthquake parameters (time, location, fault mechanism and magnitude). Also, other institutions farther away from the epicenter may estimate parameters (usually not considered "authoritative"). The submission process by the member organizations generates the authoritative composite catalog.15 Even with procedures for standardization, some noteworthy problems exist. Japanese and American seismologists usually differ with each other by 0.2 magnitude unit for the strength of surface waves of a particular earthquake.16 Newspapers cannot be relied on for accurate data because they often do not cite the authoritative values established by the working relationship between the organizations. Uniformity. The final quality of a good earthquake catalog is uniformity. There have been some small changes to the seismograph design during the last one hundred years which require back-calibration of the records to insure uniformity with recent measurements.20 Early characterization of shallow earthquakes (focal depths less than 70 kilometers) and deep earthquakes (focal depths greater than 70 kilometers) required different magnitude measurement scales. Several magnitude scales have been used over the years - Richter magnitude (ML), surface wave magnitude (Ms), body wave magnitude (mb), moment magnitude (MW), and energy magnitude (Me).21 It has been recognized that the older ML, Ms and mb scales do not properly characterize the full wave-frequency range of the energy radiated by an earthquake. The Ms scale, although widely used, does not characterize deep-focus earthquakes and great earthquakes (M ³ 8.0) very well. Therefore, newer magnitude scales use properties of the fault system (MW) or the total radiant energy spectrum (Me) to estimate the strength of an earthquake. These last two scales work for shallow and deep earthquakes as well as the largest earthquakes. However, MW and Me scales were not devised until recently, and, if used, require the recalibration of data from the major part of the early century to insure uniformity. Having stated the requirements for a catalog being accurate, complete and uniform, we can recommend five global catalogs of twentieth-century earthquakes. (1) The Zirbes Data File. The National Earthquake Information Center (NEIC) of the United States Geological Survey (USGS) maintains in Denver data on four million earthquakes from earliest records beginning in 2100 B.C.22 The summary data file currently updated yearly by Madeleine Zirbes of the NEIC includes global frequency data from this century for both shallow and deep earthquakes.23 The Zirbes file attempts to deal uniformly with the characterization of earthquakes (M ³ 7.0) of all focal depths globally. (3) The Abe Catalog. Seismologists K. Abe and S. Noguchi from the Earthquake Research Institute of the University of Tokyo published an excellent global catalog of large, shallow earthquakes (Ms ³ 7.0) for the period from 1897 to 1980.26 This database is the early effort to apply rigorous standards to make an accurate, complete and uniform catalog for large shallow earthquakes. The catalog has a supplement adding deep-focus, global earthquakes (mb ³ 7.0) for 1904 through 1974.27 The accuracy, completeness and uniformity of other catalogs should be evaluated by comparison to this noteworthy standard. (4) The Pacheco and Sykes Catalog. Javies Pacheco and Lynn Sykes of Lamont-Doherty Geological Observatory at Columbia University have published a global catalog of 697 shallow, large earthquakes (Ms ³ 7.0) which they argue is accurate, complete and uniform for the period 1900 to 1989.28 This catalog, which is a revision of the Abe Catalog, normalizes the surface wave magnitude values of Abe with a particular assumption of uniform seismicity throughout the century. The normalizing assumption has generated significant debate. (5) The Tsapanos Catalog. Greek seismologists have produced a global catalog of 9700 earthquakes with M ³ 5.5 from the period 1898 to 1985.29 The catalog of shallow and deep earthquakes is claimed to be complete for M ³ 7.0 from 1898, for M ³ 6.5 from 1930, for M ³ 6.0 from 1952, and for M ³ 5.5 from 1966. THE GEOLOGICAL EVIDENCE: ARE EARTHQUAKES INCREASING? (2) an obvious increase in the frequency of big earthquakes occurred since 1950. 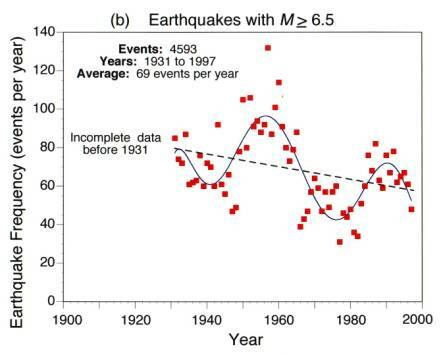 (2) an obvious decrease in the frequency of big earthquakes occurred since 1950. Lines and curves are also plotted to the data in Figure 1. Both graphical plots of global frequency data contain a dashed line showing the best-fit linear equation through the data. In both of the plots the best-fit linear equations have negative slope indicating an overall decreasing frequency, not increasing frequency with time. This decreasing seismicity trend is opposite of the common statements of many prophecy teachers. Has there been a noteworthy increase in the frequency of big earthquakes (M ³ 7.0) since 1950 as many prophecy teachers insist? No, there appears to have been a significant decrease. 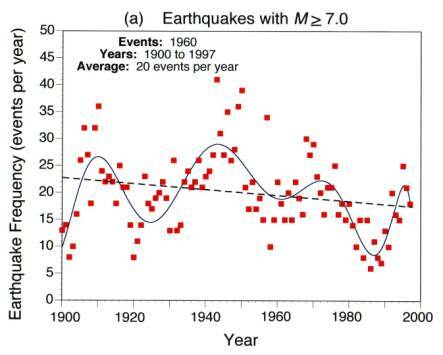 Figure 1a shows that the frequency of big earthquakes in the 1950s averaged 20.9 events per year, slightly above the average for the entire century. Is the USGS "selectively manipulating"36 its magnitude criteria (choosing to show data for M ³ 7.0 instead of M ³ 6.5) for the purpose of concealing the obvious increase in frequency as asserted by Lindsey? His claim of malpractice or deception by seismologists of the USGS is easily refuted by going to the M ³ 6.5 frequency plot in Figure 1b. This frequency plot is where the obvious rate increase of the 1980s and 1990s should be most apparent, according to Lindsey. However, we see that Figure 1b (a plot from data of file "1900.EQ") has general declining frequency with time like Figure 1a. The declining frequency is indicated by the best-fit linear equations shown by dashed lines possessing negative slopes in Figure 1a and 1b. No evidence of pronounced frequency increase is evident from Figure 1 for the 1980s and 1990s above earlier decades. Another significant property of our century's data is evident in Figure 1. The figure shows that many prophecy teachers have grossly underestimated the number of larger earthquakes, especially in the earlier part of our century. Lindsey's statistics for M ³ 6.0 earthquakes appear in Table 1. His statistics seem to demonstrate increasing frequency of M ³ 6.0 earthquakes globally, thus, supporting the urban legend. However, Table 137 compares Lindsey's numbers from his unspecified USGS source with the numbers for equivalent decades from the NGDC data file "1900.EQ". Because much higher frequency of M ³ 6.0 earthquakes has been demonstrated from "authoritative" sources (e.g., NGDC data files), Lindsey's statistics are proven incomplete, and, therefore, faulty for the purpose of frequency analysis. Lindsey's conclusion concerning increasing global frequency, which has been derived from the faulty statistics, must be in error as well. Similar global earthquake statistics and conclusions of Jeffrey,38 Stearman,39 and Lalonde40 must also be incorrect. But, again, we must ask from where did Lindsey get these statistics? No documentation is given. Lindsey's statement that only 18 magnitude 5.0-plus earthquakes occurred in California from 1900 to 1980 is contradicted by numerous seismicity catalogs of the region. Our search of the California region's historic seismic records revealed 408 earthquakes with M ³ 5.0 for the period 1900 through 1979.42 Because California's seismograph systems were not well established until 1932, a significant number of M ³ 5.0 events were not located and measured before 1932. We can make a strong argument for more than 400 earthquakes with M ³ 5.0 in the California region from 1900 through 1979, not just 18 earthquakes during that period as Lindsey supposes. Two USGS geologists Ross Stein and Thomas Hanks constructed their "Southern California Catalog" that is complete for M ³ 6.0 earthquakes from 1903 through 1997.43 They provide superb documentation for the Southern California region of 28 earthquakes (M ³ 6.0, 1903 through 1979). They ignored the more frequent but less well-documented earthquakes with M < 6.0, and they ignored all of Northern California. Still they have 28 earthquakes, a higher number than Hal Lindsey obtained for the whole state, for a longer time, and for a lower magnitude. Lindsey's California earthquake statistics must be incomplete. Is there evidence that California's M>5.0 earthquakes have increased during the last half of the century as Lindsey supposes? Because of the much higher frequency of M ³ 5.0 that we have demonstrated from "authoritative" sources, Lindsey's statistics are proven to be faulty and his conclusion, therefore, becomes vacuous. Hutton and Jones performed a detailed study of M ³ 5.0 events since 1932 in Southern California and found no significant region-wide rate change, including the period after 1980.44 They start with the year 1932 because that is the year when the data are believed to become "complete" for M ³ 5.0 events. Stein and Hanks say of Southern California, "...we find no evidence that the rate of seismicity is increasing, now or at any other time since 1900." 45 They contradict both the statistics and the conclusion of Lindsey. What about the region of Japan? As the world's most seismically active region, Japan should have an interesting story to tell. Does it show a recent increase in the frequency of earthquakes as the urban legend supposes?46 The "Japan Catalog"47 is complete for M ³ 6.0 from 1885 to 1980. Abe's catalog of global earthquakes (large, shallow quakes between 1897 and 1980) was compared to the Japan Catalog (large, shallow quakes around Japan between 1885 and 1980). Variation of earthquake frequency between the entire world and the region of Japan was demonstrated to be synchronous by sophisticated statistical tests.48 Ogata and Abe wrote, "The occurrence rate of earthquakes in the two areas is high in the period of 1920's through 1940's and low in the last 30 years. "49 That similar pattern of variation between Japan and the rest of the world did not show increase in frequency in the last half of the century. Here, again, we have an important statement that directly confronts the urban legend. DID JESUS PREDICT AN INCREASE IN EARTHQUAKES BEFORE THE END? If earthquakes are not on the increase, then what shall we make of the biblical evidence that earthquakes will increase in the last days? As noted above, Hal Lindsey says that earthquakes will continue to increase "just as the Bible predicts for the last days. "50 If earthquakes are not increasing, does this mean that the return of Christ cannot be near? Closer examination of the New Testament evidence will reveal that Lindsey's statement is wrong on both counts. Not only are earthquakes not increasing, but also the biblical text never indicated that they would. The popular conception that an increase of earthquakes in frequency and severity is a key sign of the temporal nearness of the end results from a misreading of the biblical text. Earthquakes in Biblical Literature. Earthquakes and other cataclysmic events often carry theophanic significance in Scripture, demonstrating God's awesome power. At Mount Sinai the LORD's presence was indicated by smoke and the shaking of the mountain (Exod. 19:18; cf. 1 Kings 19:1151 ; Ps. 68:8; Job 9:6; Hab. 3:6). When the New Testament church prayed "the place where they had gathered together was shaken" and the Spirit's presence was manifested (Acts 4:31). Paul and Silas were freed when God's power and presence was manifested in an earthquake (Acts 16:26). The most unusual earthquakes were associated with the crucifixion and resurrection of Christ. When Christ died on the cross, an earthquake shook the temple and rent the curtain of the temple from top to bottom (Matt. 27:51). No human agency rolled away the stone that sealed Christ's tomb; it was the angel in the presence of the earthquake (Matt. 28:2). Yet during the awesome shakedown of heaven and earth, "The LORD will have compassion on Jacob" (Isa. 14:1), and all creation will recognize God's working (Isa. 14:3-8). When Israel is attacked by the armies of Gog, those armies are demolished at the decree of the LORD by earthquake and cosmic hailstones (Ezek. 38:17-23). Zechariah is even more explicit about the extraordinary geologic upheaval in the Holy Land associated with the Day of the LORD. A final earthquake at the LORD's return will split the Mount of Olives, uplift Jerusalem on its site, and depress the surrounding Judean Mountains (Zech. 14:1-10). Earthquakes are also associated with God's self-revelation in the eschatology of the book of Hebrews (Heb. 12:25-29). The author warns his readers not to refuse to heed the God who speaks as he spoke at Sinai ("And His voice shook the earth then," Heb. 12:26; cf. Exod. 19:18). The author then passes through history from Sinai to the promise of a great cosmic upheaval of the end time ("Yet once more I will shake not only the earth but also the heaven," Heb. 12:26; cf. Hag. 2:6). God's ultimate purpose is to give believers "a kingdom which cannot be shaken" (Heb. 12:28) so that the faithful, having perceived his extraordinary power, can "offer to God an acceptable service with reverence and awe" (Heb. 12:28). Such passages provide the eschatological backdrop for the book of Revelation, where earthquakes are symbols of God's final judgment upon the earth. They appear as climactic judgments throughout the book, producing terror, awe and destruction among the earth's inhabitants. Five earthquakes are described. These are at the opening of the sixth and seventh seals (6:12; 8:5), just before and after the seventh trumpet (11:13, 19), and during the seventh bowl (16:18). This last earthquake is identified as the greatest ever on earth (16:18), splitting Jerusalem into three parts and destroying the cities of the nations. Although demonstrating the awesome power and presence of God, these passages do not indicate an increase in earthquakes in the present age. For those who follow a futuristic and dispensational interpretation of Revelation, these earthquakes occur during the Great Tribulation, not before it. They are not precursors to the Day of the LORD, but evidence of its presence. Among dispensationalists there are two main interpretations of these verses. As we shall see, neither confirms that earthquakes will increase as the present Church age draws to a close. (1) Some dispensationalists see the whole of the Olivet Discourse as relating to the tribulation period. Verses 4-8 are usually said to concern the disturbances of the first half of the tribulation while verses 9-26 concern the second half - the Great Tribulation.53 Evidence for this is claimed in the similarity between the events described in verses 4-8 and those associated with the seven seals of Revelation 6.54 For advocates of this view, the earthquakes identified in verses 7-8 are not part of the present Church age, but rather the tribulation period. In this case, even if the birth image in verse 8 were to indicate an increase in earthquakes (which is not necessary - see discussion below), this increase occurs during the tribulation, not during the present Church age. Present (Church age) data concerning earthquake frequency has little or no bearing on the text. (2) Other dispensationalists (as well as many non-dispensationalists) claim that verses 4-8 (or verses 4-14) concern not the tribulation period, but general signs which are characteristic of the present age. Lewis Sperry Chafer wrote that the events described in verses 4-8 "are the characteristics of the unforeseen intervening or intercalary age"55 - that is, the Church age. John Walvoord similarly affirms that "verses 4-14 are general prophecies that can find fulfillment throughout the present age, with verses 15-30 fulfilled in the Great Tribulation. "56 He adds, however, that these former events "are repeated in the Great Tribulation when what was perhaps partially fulfilled earlier then have a very literal and devastating fulfillment. "57 The primary evidence that verses 4-14 are signs characteristic of the present age are their general nature and the fact that Jesus identifies them as events which do not indicate the end ("but that is not yet the end") and so should not provoke apocalyptic fervor ("see that you are not alarmed"). While Walvoord affirms that these are events common to the present age and that they, therefore, do not constitute the answer to the disciples' question ("what will be the sign of your coming? "), he jumps to the unwarranted conclusion that these "general signs" will increase in intensity as the end of the age approaches. But Jesus did not indicate such an increase. He rather downplayed their significance and encouraged his followers not to be alarmed or disturbed by them. He certainly did not say to count their frequency and calculate the end. Eschatological Birth Pains. The only statement which might suggest an increase in famine and earthquake activity is the final clause, "But all these things are merely the beginning of birth pangs (hwdíneß)" (Matt. 24:8). Because birth pains begin small and then increase in intensity and frequency, this passage could be interpreted to mean that earthquakes will start small and infrequent and gradually increase. When they reach their greatest severity and frequency, they will give birth to the new age. But is this the correct way to interpret this clause? If so, the lack of seismic increase we have noted above would confirm that Jesus' return is not near. This would then contradict the many biblical statements that it is near! But there is good reason to believe that Jesus' words do not indicate an increase in frequency or severity of these "general signs," but only indicate their continued recurrence until the end of the age. The image of eschatological birth pains was not new with Jesus, but was a common one in Jewish apocalyptic and later rabbinic writings. The "messianic woes" or "birth pains of the Messiah" referred to a period of suffering that would immediately precede the coming of the messianic age.61 The primary conceptual significance of this image was not that the pain would increase in intensity, but rather that the present period of suffering would be followed by the joy of new birth (i.e., salvation and restoration). Pain will give way to rejoicing for those who persevere. The apostle Paul uses the birth image in a similar way in Romans 8:18-25. The present creation - for which salvation has been achieved but not consummated - "waits eagerly for the revealing" of the children of God (v. 19). This period of waiting is metaphorically described as groaning and suffering "the pains of childbirth (sunwdínw)" (v. 22). The point is not that creation's pain is growing worse and worse, but that the pain itself (the residual effects of humanity's fall) provokes eager longing for the new birth (the consummation of salvation). Paul uses the birth image elsewhere to illustrate the abruptness of the arrival of the Day of the LORD. It will be unexpected "like a thief in the night" and "like labor pains" on a pregnant woman (1 Thes. 5:2,3). Paul's two images are reminiscent, of course, of the Olivet Discourse (Matt. 24:8,43,44). Obviously, Paul is not saying here that we can predict our Lord's appearance by noting precursor birth pains. A number of prophecy teachers say that a pronounced increase in frequency and intensity of earthquakes has occurred in the latter part of the twentieth century, a worldwide trend fulfilling a prophecy made by Jesus. Contrary to these prophecy teachers, no obvious trend is found indicating an abnormal increase in the frequency of large earthquakes during the last half of the twentieth century. Neither is there a noteworthy deficiency of earthquakes in the first half of the century. Graphical plots of global earthquake frequency indicate overall a decreasing frequency of earthquakes through the century. The decades of the 1970s, 80s and 90s experienced a deficit of larger earthquakes compared to earlier decades of the century. The 70s, 80s and 90s are precisely those decades that many prophecy teachers suppose, erroneously, show a dramatic surplus of larger earthquakes. Regional earthquake data from California and Japan also do not argue for increasing earthquake frequency in the latter decades of our century. At the time of Christ the Jews had a heightened anticipation that wars, famines, pestilence and earthquakes communicated signs having apocalyptic significance. Jesus responded to apocalyptic expectations in the Olivet Discourse. Whether one interprets Matthew 24:4-14 as (1) events which will occur during the tribulation period, or (2) general signs of the present age, there is no clear scriptural warrant for the claim that earthquakes will increase dramatically prior to the return of Christ. In the former interpretation, these earthquakes would be part of the tribulation period and so of little significance for any increase in earthquakes during the present Church age. In the latter interpretation, earthquakes are seen as recurring catastrophic events common to the present age - events that must not be misinterpreted as "signs" of an immediate end. It is ironic that a passage that intentionally teaches that earthquakes are not indicators of the "end of the age" should be so frequently interpreted as teaching exactly the opposite. Jesus' statement, "all these things are merely the beginning of birth pangs" (Matt. 24:8), has been misunderstood to imply that pain would increase steadily in time. The birth image associated with such signs does not point (necessarily) to an increase in pain with time. Paul's understanding of creation's pain (Romans 8:18-25) is not that pain will grow steadily worse, but that the present period of suffering provokes eager longing for the new birth and the consummation of the coming age. The author of Hebrews sees a similar hope, not in anticipating a future "sign" of increasing earthquake activity, but in the coming of a sudden cosmic cataclysm producing a "kingdom which cannot be shaken" (Heb. 12:28). Figure 1. Global frequency of the largest earthquakes during the twentieth century. Graph (a) shows the frequency of M ³ 7.0 earthquakes during the entire century (1960 events). Graph (b) shows the frequency of M ³ 6.5 earthquakes after 1930 (4593 events). In both plots a general decrease in earthquake frequency is evident through the twentieth century. Table 1. Numbers of M ³ 6.0 earthquakes worldwide in the twentieth century. The numbers of earthquakes reported in the National Geophysical Data Center file called "1900.EQ" greatly exceed those reported by Hal Lindsey from his unspecified U.S. Geological Survey source. Hal Lindsey, Apocalypse Code (Palos Verdes, CA: Western Front Ltd., 1997), p. 296. The term "killer quake" is not defined. See also Hal Lindsey, Planet Earth 2000 A.D. (Palos Verdes, CA: Western Front Ltd., revised edition, 1996), p. 85, where Lindsey says these statistics refer to earthquakes of magnitude 6.0 and greater. Lindsey has been writing about the twentieth century increase of earthquakes for almost 30 years. See his book The Late Great Planet Earth (Grand Rapids: Zondervan, 1970), p. 52, that sold over 20 million copies. Lindsey, Planet Earth 2000 A.D., p. 86. Table 1 lists Lindsey's earthquake statistics. Lindsey's citation here is suspicious. Though he claims to be using a USGS source, his endnote (p. 105) refers only to the Los Angeles Herald Examiner, May 22, 1984. One wonders how a newspaper published early in 1984 could provide data for an increase in earthquakes in the 1980s and 1990s. Grant R. Jeffrey, Prince of Darkness (Toronto: Frontier Research Publications, 1994), pp. 310, 311. Jeffrey gives no information on how a copy of this report can be obtained (author, date, report name, and location). Furthermore, the numbers from Jeffrey's USGS source differ slightly from Lindsey's USGS source. Which is the better USGS source? Jeffrey repeats these statistics in his later books The Signature of God (Toronto: Frontier Research Publications, 1996) p. 194, and Armageddon: Appointment with Destiny (Toronto: Frontier Research Publications, revised edition, 1997), pp. 251, 252. In Armageddon (p. 252) Jeffrey is very confident in his earthquake statistics: "Anyone who examines the record of massive increases in earthquakes in our century must acknowledge that this is extremely unusual. The increase is unprecedented in recorded human history and, in light of the Bible's prophecies, these statistics provide incontrovertible evidence that we are living in the last days. J. R. Church, "Riders of Revelation 6, Mount Up!," in William T. James, Foreshocks of Antichrist (Eugene, Harvest House, 1997), p. 336: "Nevertheless, when one looks at modern records, one invariably sees a steady increase in earthquake activity, ranging across the spectrum from large events to small tremors. Gary Stearman, "Are Earthquakes on the Increase?" Prophecy in the News 16 (June 1996): pp. 3-5. These are the numbers cited by Lindsey. We searched the archive of the Philadelphia Inquirer on July 22, 1998 on the Internet at URL: http://www.phillynews.com. We searched all earthquake articles of the 1990s through June 1998. Gary Stearman, "Earthquakes Are Indeed on the Increase," Prophecy in the News 16 (October 1996): pp. 27, 28. John Hagee, Beginning of the End (Nashville, Thomas Nelson Publishers, 1996), p. 193. Hagee, Beginning of the End, p. 193. Hagee, Beginning of the End, p. 193. Hagee, Beginning of the End, p. 98, "…the number of earthquakes recorded has risen from 2,588 in 1983 to 4,084 in 1992." Here Hagee has committed a serious error by citing the "No Magnitude" row in the National Earthquake Information Center (NEIC) worldwide seismic frequency table. He supposes erroneously that the "No Magnitude" row is the total number of earthquakes that have been located globally for both of the years. The NEIC "Preliminary Determination of Epicenters" database (PDE) for 1983 locates 9,842 events globally (2,588 events with no magnitude data given), and that database for 1992 locates 19,548 events globally (4,084 events with no magnitude data given). The apparent doubling of earthquake frequency from 1983 to 1992 is caused by significant improvement by 1992 in the detection and location of magnitude less than 5.0 earthquakes. For magnitude greater than or equal to 5.0, the PDE locates 1813 events in the year 1983, but locates only 1668 events in 1992. For magnitude greater than or equal to 6.0, the PDE locates 140 events in 1983, but locates only 127 events in 1992. The data might better argue for decreasing frequency with time, contrary to the conclusion of Hagee. The above numbers were obtained on december 28, 1998 by going to the NEIC files on the Internet at: http://wwwneic.cr.usgs.gov and then going to the NEIC-PDE data using the "Search Earthquake Data Base" function. The earthquake data file cited by Hagee contains the cautionary statement, "As more and more seismographs are installed in the world, more earthquakes can be and have been located." See the summary NEIC-PDE data file at: http://wwwneic.cr.usgs.gov/neis/eqlists/eqstats.html which closely resembles the source of Hagee's numbers. Therefore, our analysis shows Hagee's argument for increased earthquake frequency in the 1990s to be seriously flawed. Charles Capps in End-times Events-Journey to the End of the Age (Tulsa, Harrison House, 1997) commits a similar error by citing the much-increased lower-magnitude location ability within the most recent NEIC data: "A recent U.S.G.S. report shows there were 4,139 earthquakes in 1970 -and 19,996 in 1996." Capps concludes, "...earthquakes are definitely on the increase." (p. 13). Peter and Paul Lalonde, 301 Startling Proofs & Prophecies (Niagara Falls, ONT: Prophecy Partners Inc., 1996), p. 248. The Lalonde earthquake frequency numbers have been widely quoted in popular publications. For example, we found the above Lalonde quote reprinted in Daymond R. Duck, Revelation: God's Word for the Biblically-Inept (Lancaster, PA: Starburst Publishers, 1998), p. 242. The Lalonde statistics were rephrased by Jack Van Impe, "Last Days: Hype or Hope?," Perhaps Today (September, October 1996), viewed on August 20, 1998 on the Internet at: http://205.244.46.136/PerhapsToday/SeptOct1996/last.html. Van Impe says: "In Matthew 24, Jesus predicted such fearful signs just before His return. He said they would be like birth pangs - increasing in frequency and intensity as the time of the end drew near.... From 1900 through 1969, a 70-year period, there were only 48 quakes of 6.5 magnitude or greater. But from July 1990 through 1992, a three-year period, there were 133 great quakes!" For other statements about the apocalyptic increase of earthquakes in the 1990s see David Allen Lewis Signs of His Coming (Green Forest, AR: New Leaf Press, 1997): "…there have been more earthquakes in the last 50 years than in the previous 1,500 years." (p. 24). Lester Sumrall, "Famines, Pestilence, Earthquakes, as Man Rebels," in Bob Anderson et al., Earth's Final Days (Green Forest, AR: New Leaf Press, 1995), p. 68 says: "In this century, there have been more earthquakes than all the rest of history put together…. Every 10 years, earthquakes double in number, and so it has been for the last 10 decades. During the later part of this decade, earthquakes will occur with increasing regularity, creating terror and panic throughout the world. Jesus said that was one of the signs of His coming." If earthquakes are increasing so rapidly in the 1990s, then what is there to prevent Christ's return? Therefore, in Larry Wilson, The Revelation of Jesus (Brushton, NY: Teach Services, 1992), p. 1, we find the former Seventh-day Adventist pastor predicting four global earthquakes beginning about 1994 and ending in 1998 with the Second Coming of Christ. For a recent survey of thinking on earthquakes and other natural disasters as apocalyptic signs see Richard Abanes, End-time Visions: The Road to Armageddon? (Nashville, Broadman & Holman, 1998), 428 p. For a review of authors before the 1990s who advocated the increase in frequency and intensity of twentieth-century earthquakes see the chapter "Earthquakes and Historical Facts" in Carl O. Jonsson and Wolfgang Herbst, The "Sign" of the Last Days - When? (Atlanta: Commentary Press, 1987), pp. 46-87. Interested researchers can investigate the Council of the National Seismic System (CNSS) composite catalog on the Internet at URL: http://quake.geo.berkeley.edu/cnss. O. J. Perez and C. H. Scholz, "Heterogeneities of the Instrumental Seismicity Catalog (1904-1980) for Strong Shallow Earthquakes," Bulletin of the Seismological Society of America 74 (1984): p. 685. An incident illustrates why earthquake catalogs need to be checked carefully for completeness. In 1997 we consulted the "Worldwide Earthquake Catalog" maintained by the Council of the National Seismic System (CNSS) for seismic events of the 1990s. The CNSS "Worldwide Earthquake Catalog" was examined at Internet URL: http://quake.geo.berkeley.edu/cnss on december 28, 1997. Because this is a composite database assembled from the records of the thirty member organizations, we might assume it to be a "complete" catalog. However, when we consulted records maintained by CNSS member organizations, we found them to include earthquakes not in the composite database. We even found many earthquakes of the early 1990s with M ³ 7.0 that were not in the composite database. The lesson is obvious: careful study must be conducted before an earthquake catalog can be said to be "complete." It takes a deliberate process to make a "complete" catalog. T. M. Tsapanos and P. W. Burton, "Seismic Hazard Evaluation for Specific Seismic Regions of the World," Tectonophysics 194 (1991): p. 154. Tsapanos and Burton, "Seismic Hazard Evaluation for Specific Seismic Regions of the World," p. 154. K. Abe, "Complements to 'Magnitudes of Large Shallow Earthquakes from 1904 to 1980'," Physics of the Earth and Planetary Interiors 34 (1984): pp. 17-23. For an excellent summary of earthquake magnitude scales see W. Spence, S. A. Sipkin and G. L. Choy, "Measuring the Size of an Earthquake," Earthquakes and Volcanoes 21 (1989): pp. 58-63. The paper has been posted on the Internet at URL: http://wwwneic.cr.usgs.gov/neis/general/handouts/measure.html. An Internet site with National Earthquake Information Center databases and summary files is open to the public. The Internet URL for the NEIC home page is http://wwwneic.cr.usgs.gov. National Oceanic & Atmospheric Administration, Seismicity Catalog (Boulder, CO: National Geophysical Data Center, 1996), two volumes on CD-ROM disks. A description and current updates to the "Worldwide Earthquake Database" and its Seismicity Catalog are maintained on the Internet. The file "1900.EQ" is part of the global NGDC "Seismicity Catalog" on CD-ROM. The data file has not been screened rigorously for duplicate events below magnitude 6.5, and some of the events of lower magnitude, which normally might be supposed to be aftershocks or foreshocks, are likely duplicated listings. Therefore, the data file "1900.EQ" probably overestimates the frequency of magnitude 6.0 events globally. K. Abe, "Magnitudes of Large Shallow Earthquakes from 1904 to 1980," Physics of the Earth and Planetary Interiors 27(1981): pp. 72-92. K. Abe and S. Noguchi, "Determination of Magnitude for Large Shallow Earthquakes 1898-1917," Physics of the Earth and Planetary Interiors 32 (1983): pp. 45-59. K. Abe and S. Noguchi, "Revision of Magnitudes of Large Shallow Earthquakes, 1897-1912," Physics of the Earth and Planetary Interiors 33 (1983): pp. 1-11. K. Abe, "Complements to 'Magnitudes of Large Shallow Earthquakes from 1904 to 1980'," Physics of Earth and Planetary Interiors 34 (1984): pp. 17-23. K. Abe and H. Kanamori, "Temporal Variation of the Activity of Intermediate and Deep Focus Earthquakes," Journal of Geophysical Research 84 (1979): pp. 3589-3595. J. F. Pacheco and L. R. Sykes, "Seismic Moment Catalog of Large Shallow Earthquakes, 1900 to 1989," Bulletin of the Seismological Society of America 82 (1992): pp. 1306-1349. T. M. Tsapanos, E. M. Scordilis and B. C. Papazachos, "A Homogeneous and Complete Catalog for World's Great Earthquakes Covering the Time Period 1898-1985," Publication of the University of Thessaloniki, Geophysics Laboratory (1988): p. 182. The NGDC statistics come from the file "1900.EQ" contained in volume 2 of the CD-ROM called "Seismicity Catalog" issued in 1996 jointly by the NGDC and the NEIC. Anyone wishing to evaluate completeness of earthquake statistics globally for M ³ 6.0 cited by prophecy teachers should consult this file. The file is in ASCII code that can be read by any word processor and imported into a spread sheet. Because the file "1900.EQ" is not copyrighted, the authors can make a copy available on floppy disk to anyone requesting it. Abe and Kanamori, "Temporal Variation of the Activity of Intermediate and Deep Focus Earthquakes." J. Xanthakis, "Possible Periodicities of the Annually Released Global Seismic Energy (M ³ 7.9) during the Period 1898-1971," Tectonophysics 81 (1982): pp. T7-T14. Y. Ogata and K. Abe, "Some Statistical Features of the Long-Term Variation of the Global and Regional Seismic Activity," International Statistical Review 59 (1991): pp. 139-161. I. Liritzis and T. M. Tsapanos, "Probable Evidence for Periodicities in Global Seismic Energy Release," Earth, Moon, and Planets 60 (1993): pp. 93-108. Y. Ogata and K. Katsura, "Analysis of Temporal and Spatial Heterogeneity of Magnitude Frequency Distribution Inferred from Earthquake Catalogues," Geophysical Journal International 113 (1993): pp. 727-738. Researchers suggest the inhomogeneity of earthquakes may be related to some type of internal global fluctuation within the earth, perhaps a variation in the large-scale motion of the earth. Could a slight wobble during the earth's rotation correlate with the inhomogeneous data? Is there occasional chaotic motion within the earth's liquid outer core that correlates with earthquakes in the crust? Earthquake frequency cycles appear to be real, but the cause remains speculative. An observer might say it is like monitoring birth pangs. When will the next ones come? How long will we have to wait? The observed earthquake frequency pattern is consistent with creationist ideas suggesting overall exponentially declining tectonism and volcanism following a recent geologic upheaval such as Noah's Flood. The data may present a problem for the skeptic of the doctrine of Creation and the opponent to the reality of Noah's Flood. Such a uniformitarian skeptic would want to say, "everything goes on as it has since the beginning of creation" (2 Peter 3:4 NIV). The skeptic might not want to acknowledge such a declining pattern over time. Lindsey, Planet Earth 2000 A.D., p. 88. Lindsey, Planet Earth 2000 A.D., p. 89. "By selectively manipulating the criteria used to determine a 'major quake,' the USGS can effectively argue against any increase in seismic activity." Lindsey's assertion of selective manipulation is demonstrated to be incorrect by data displayed in Figure 1b. Lindsey's statistics for M ³ 6.0 earthquakes in Table 1 come from Planet Earth 2000 A.D., p.85,86.